The paths of Representative Robert G. Clark, Jr. and Dr. John A Peoples, Jr. crossed in 1948 on the campus of Jackson State College. Clark and Peoples enrolled as freshmen in 1948 and ’47 respectively. They were scholar athletes and student leaders. Rep. Clark was the first Jackson State Student to be awarded a track scholarship. Dr. Peoples played football as a split end. These two distinguished Jackson State graduates went on to achieve a number of firsts in their long careers. Representative Robert G. Clark Jr. became the first African American elected to the Mississippi House of Representatives since Reconstruction. He was also the first Black person to chair a committee (the education committee) in the Mississippi House of Representatives. Dr. John A. Peoples was the first graduate to serve as President of his alma mater. He was also the first Jackson State graduate to receive a doctorate from the University of Chicago. 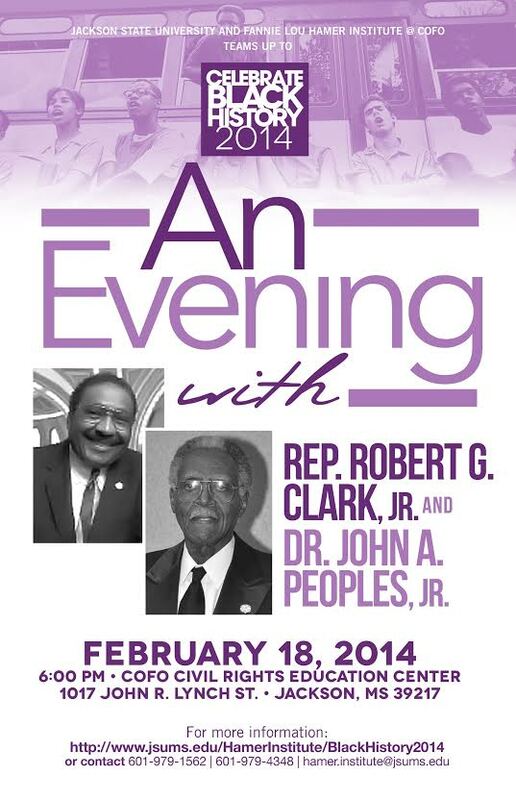 Clark and Peoples will discuss their careers and the impact Jackson State had on their lives. They will also discuss their current interests and the future of higher education and politics in Mississippi.